Fall means many different things for students — buying new books, moving into new dorms or apartments, going to football games and buying pumpkin spice lattes from Starbucks are all autumnal rites of passage. But for more than 300 student performers, endless rehearsals on campus signify the beginning of fall. The Pitt Band first-year students moved in early Aug. 14, and after a few rehearsals in Oakland, the full band headed to Pitt’s Bradford campus for band camp Aug. 16. Dr. Bradley Townsend, director of Pitt’s marching, concert and pep bands, shared his plans to train the band for the upcoming season with TPN Aug. 11. Despite starting the practices so early, Townsend is excited to see his musicians, dancers and color guard perform the shows he has planned for the season. Pitt Band’s assistant drum major, junior history major Chrissy Shannon, also shared her enthusiasm for the upcoming disco performance — which will feature some very special guest performers on display at Heinz Field. Shannon, who played the sousaphone in Pitt Band before earning a drum major position, detailed some of the adventures that Pitt Band has planned for this season. 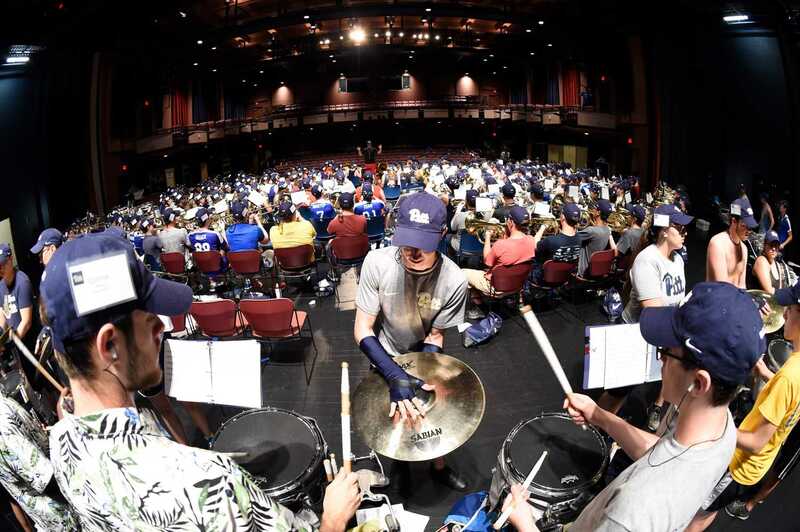 With the entire student body and many alumni looking forward to the rivalry at the Pitt versus Penn State football game at Heinz Field this fall, the band is saving one of their best shows for that game. Shannon and Townsend both confirmed that the music of “The Greatest Showman” will be the show for the big game day Sept. 8. Aside from the excitement of the new shows, football games and trips, many members of Pitt Band are just as excited to be back with their band family doing the activity they love. Junior neuroscience and psychology major Katie Clouse, a trumpet squad leader in the band, shared her desire to get back on the field to experience the pre-game commotion she has grown attached to. Throughout her years in band, Clouse has had many experiences that create the same feeling of excitement and pride. One that sticks out for her is the reaction from the Pitt football audiences when the band achieves intricate formations on the field. She also remembers a Batman logo formation from her freshman season was a big hit. “I think something else that always makes me happy is when we get videos of a show and it looks awesome and we get to all watch it and be so happy with ourselves because we pulled something cool off,” Clouse said. Both Clouse and Shannon spoke in extraordinarily positive terms about their past, present and future experiences with Pitt Band — something that their director seemed to pass on to them. “I’m most excited to see the improvements that happen this year — we have the biggest band we’ve had in a while and each year we keep improving,” Townsend said. The former tuba player acknowledged the talent of his students as he shared his thoughts on the significance of the upcoming season.